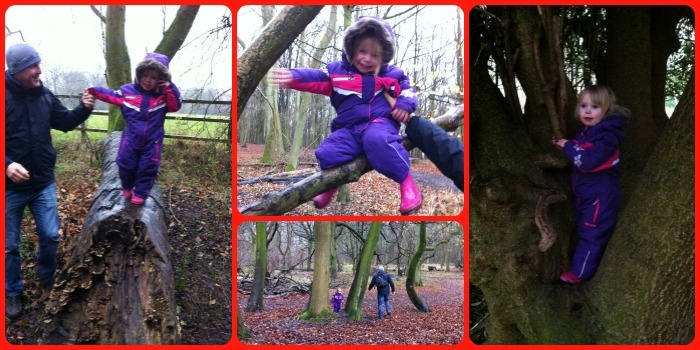 On a rather wet Saturday morning in December, we decided to head to Ashridge for a walk. I'd seen that they had a Christmas Trail running in the lead-up to Christmas. This year the theme was Twelve Days at Ashridge. 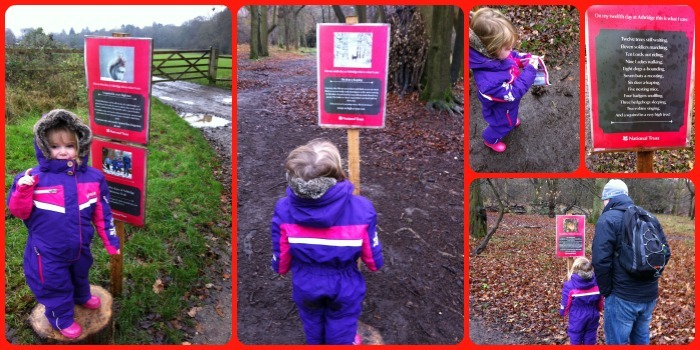 We did the Christmas Trail on a similarly cold and wet day in 2014! It's actually a great option to just get out of the house for a couple of hours. An easy walk that Little Miss A can manage on her own and the Trail adds interest along the way. We picked up the Trail sheet in the Visitors Centre and then set off. There were wooden posts around the Trail with facts about the wildlife that lives in Ashridge, with accompanying questions on the sheet to fill in. We also took some pictures of Little Miss A with the scan picture of her new brother or sister, due in May. The first attempt didn't go too well but whilst she was climbing trees, she asked to hold the picture so we took lots of photos of her which we used for our Baby Announcement. We popped back into the Visitors Centre at the end of the Trail to collect the prize - admittedly we'd filled in most of the Trail sheet but Little Miss A enjoyed the sweet! After a hot drink in the Cafe, it was time to head home. This Trail was a great way to get us out that morning. We saw a couple of other families along the trail, so we weren't the only ones braving the elements that day! The Trail is a great distance of toddlers to manage to walk around. It cost just £1 for the Trail sheet. It's really great that it's free parking at Ashridge, so always worth going for a walk whatever time of year!